Perfect Stranger\r\nStarring Halle Berry and Bruce Willis. Directed by James Foley. Written by Todd Komarnicki. Rated R.\r\n\r\nGrindhouse\r\n�Planet Terror.� Starring Freddy Rodr�guez, Rose McGowan, and Marley Shelton. Written and directed by Robert Rodriguez. Rated R. �Death Proof.� Starring Kurt Russell, Rosario Dawson, Tracie Thoms, and Zoe Bell. Written and directed by Quentin Tarantino. Rated R.
Two cheap thrillers this week, but only one�s worth the money. Perfect Stranger is a ride that gives off some serious warning rattles before its wheels fall off. The movie stars Halle Berry as Rowena Price, a New York reporter whose childhood best friend Grace (Nicki Aycox) comes to her with the news that she�s been having a hot and heavy affair with Harrison Hill (Bruce Willis), the head of a gigantic ad agency. Recently tossed aside by the adman, Grace makes noises about going to his wife. When Grace subsequently turns up dead, Ro assumes a fake identity, takes a job as an office temp at Hill�s agency, and dangles her fine self in front of him as bait. I feel obligated to point out that this isn�t how reporters usually work, though Ro�s willingness to cross a few professional lines is made semi-credible by the fact that she�s been professionally thwarted and pissed off (in a completely unbelievable opening segment). Of greater concern: Ro�s supposed to be the best investigative reporter around, yet she never seriously considers Hill�s wife as a suspect, nor does she have any clue about her technogeek colleague (Giovanni Ribisi) who�s nursing a psychopathic crush on her. Despite this and Berry�s typically amateurish performance, the movie might have done all right had it concentrated on Ro�s entrapment of Hill. Instead, her colleague�s obsession turns out to be part of a needlessly complicated and crazily bad larger story involving Ro�s cheating boyfriend (Gary Dourdan) and her own previous experience of sexual abuse. It�s like it�s not enough for thrillers to simply thrill any more. They need to have a shocking plot twist to blow the audience�s mind, or better yet, blow the mind of one A-list actor so that they�ll agree to star in the thing. While you can appreciate the effort that goes into inventing a development like this, the fact is that the ploy fails more often than not, and when Perfect Stranger collapses in on itself, the wreckage is ugly and hilarious. Rodriguez� watchable film nevertheless takes the genre a shade too literally, copying the look and feel of cheap horror flicks but forgetting to put a distinctive spin on those movies, save for the nifty over-the-top touch of Rose McGowan as a go-go dancer whose chewed-off leg is replaced by a machine-gun prosthesis. Far more interesting is Tarantino�s segment, which revolves around Kurt Russell as Stuntman Mike, a psycho killer whose weapon of choice is his car, which has been �death-proofed,� i.e. specially reinforced so that the driver can�t be killed even if he drives the car into a brick wall at 125 mph. The conversations among all of these women are flavorful, witty, and distinctively Tarantinoid, though there�s too much teasing about an activity called �ship�s mast,� which turns out to be an insanely stupid car game that looks like quite a bit of fun. It�s played by three professionals enjoying a few days off from a Hollywood movie that they�re shooting: a stunt driver (Tracie Thoms), a makeup artist (Rosario Dawson), and Zoe Bell, a New Zealand stuntwoman who portrays herself (she doubled for Uma Thurman in the Kill Bill movies). When Stuntman Mike attacks them, he quickly finds out he�s messed with the wrong women. Terrifically, he turns out to be a big wuss when he�s challenged. 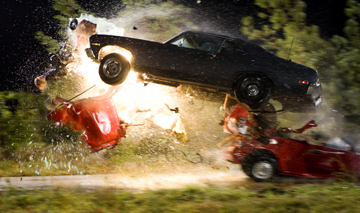 The extended car duel between them takes up the whole second half of �Death Proof,� and you�ll be holding your breath the entire time, especially watching Zoe hang on to the hood of her car and wondering how many bumps from Stuntman Mike�s car she can take before falling off. For a three-hour film, it�s good that Grindhouse saves its electrifying best for last.